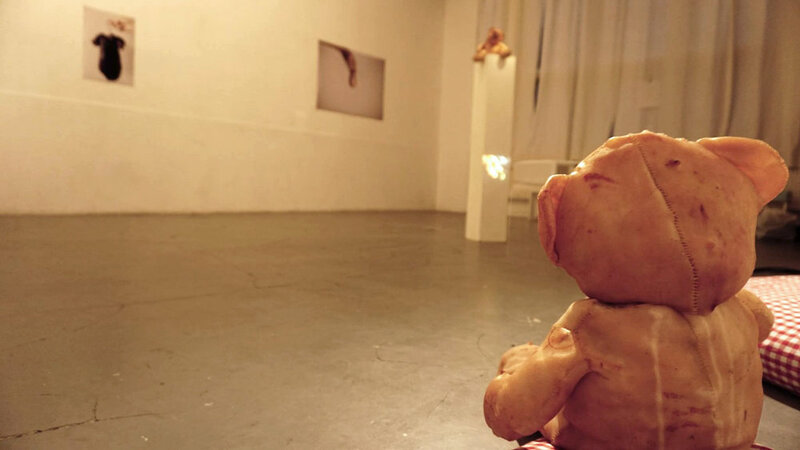 Paula Blower works with ephemeral materials such as pig’s skin. 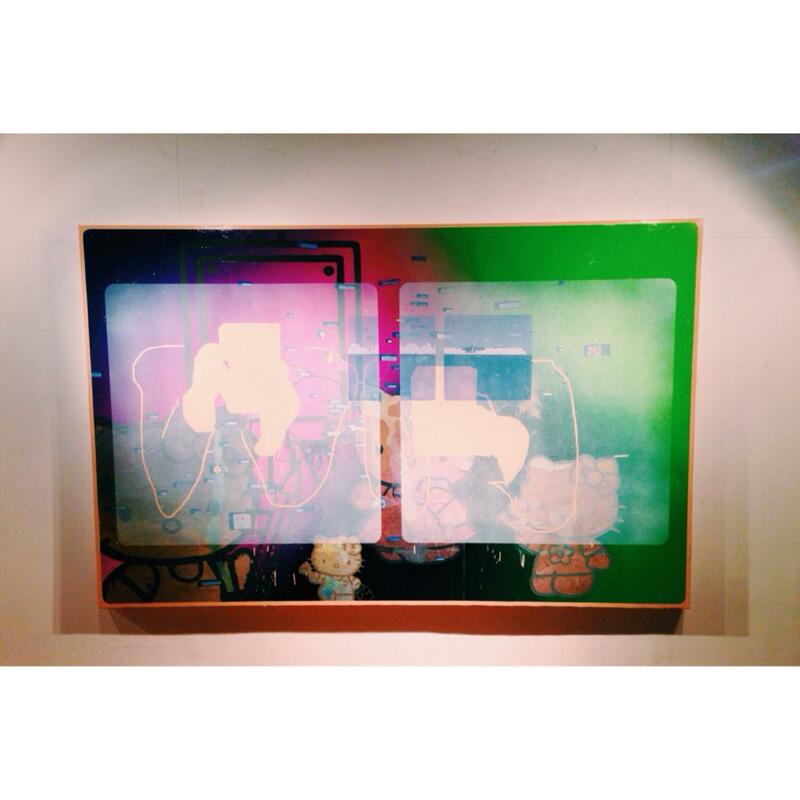 She likes to experiment to contrast the image of the material she uses and objects she creates with them. 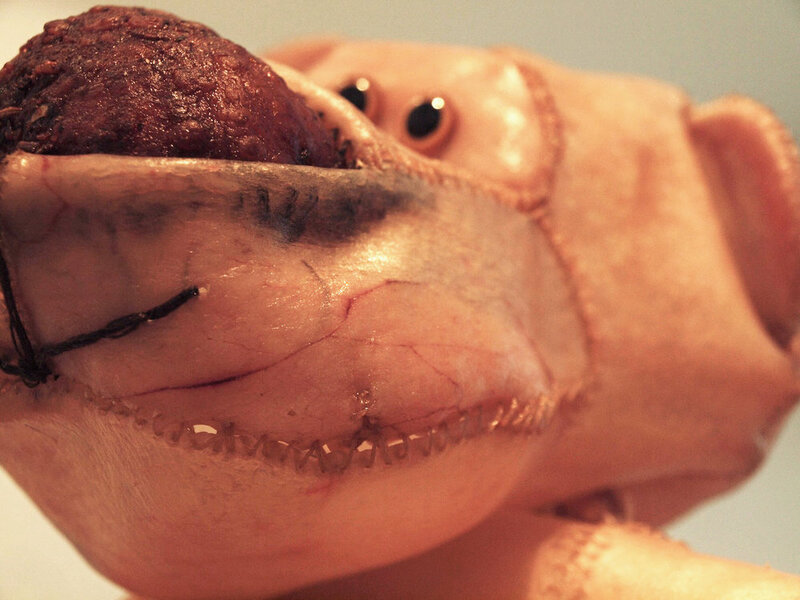 The Teddy Bears that she created represent contradictory natures combined in one body: a cute looking doll in deadly pork skin. Depending on how far you look from it, you will feel the ambivalence between the object and material. The ephemeral material and the ambivalence in viewing the object from different distances, provides a metaphor to everything in our world: a beautiful facade with darkness never too far behind. Superficial charm from far away and uncomfortable truth up close. The exhibition “Roosevelt’s PIcnic” is all about the irony of cuteness, acting as a reminder of the superficial surface and the story behind. When you enter the space, you will hear the song “Teddy Bear’s Picnic”. The melody is bright and pleasant, contrasts with the lyrics and its sense of gloom. You see Teddy Bears sitting here and there. They look just cute and harmless in a distance, meanwhile you will see raw dead pork skin up close. In a corner of the space, the big Teddy Bear sits on a pillow looking welcoming. You can sit next to him and have a silent conversation. If you feel lost for words around the inanimate guests then the dialogue on the wall will guide your imagination towards the story of the Teddy Bear. 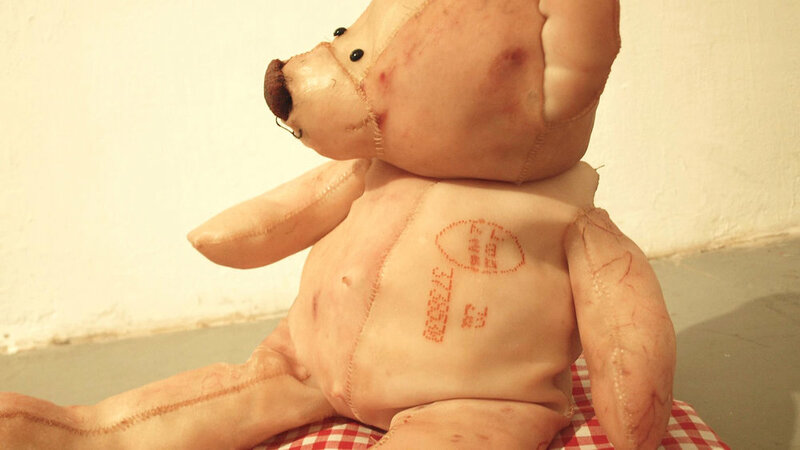 This exhibition also shows the amount of work that goes into making the Teddy Bear. It takes enormous amount of manual labor and time to handle with pig skin as a material. The creation of Teddy bear is a very intimate craftsmanship. 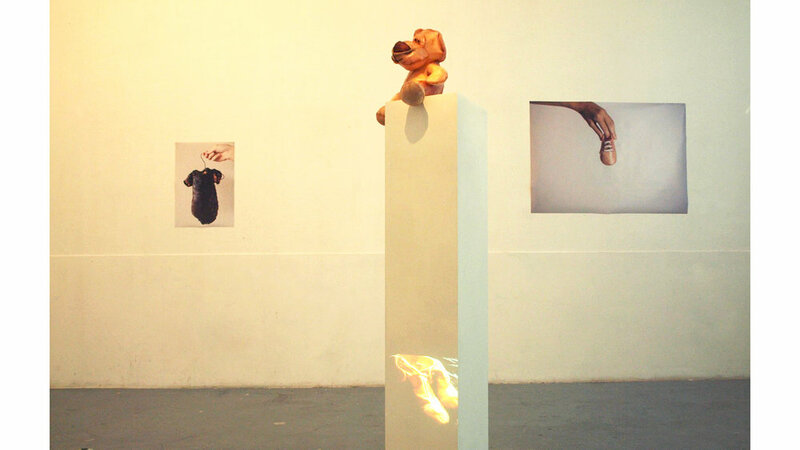 The exhibition presents a series of works by Sooji Lee that started from a question “What about us is unique and can’t be replicated by machines?”. The project studies the value of ‘human originality’. She finds the originality in our inherent ‘imperfection’ as she explores craftsmanship as a prime example of our pursuit of perfection. She shows craftsmanship through an installation meant to manually produce the Bodoni typeface. Typefaces are one of humanity’s earliest and primary examples of mass-production. Lee’s installation and extensive research on the lowercase ‘a’ in the Bodoni typeface could theoretically allow her to create the “perfect” reproduction. However despite her countless efforts, her results always end up slightly imperfect in various ways. In these imperfections lies the heart of our originality and they represent the divide between us and machines. Lee’s installation embraces this human quality and celebrates it, acknowledging our desire for perfection despite always falling slightly short. 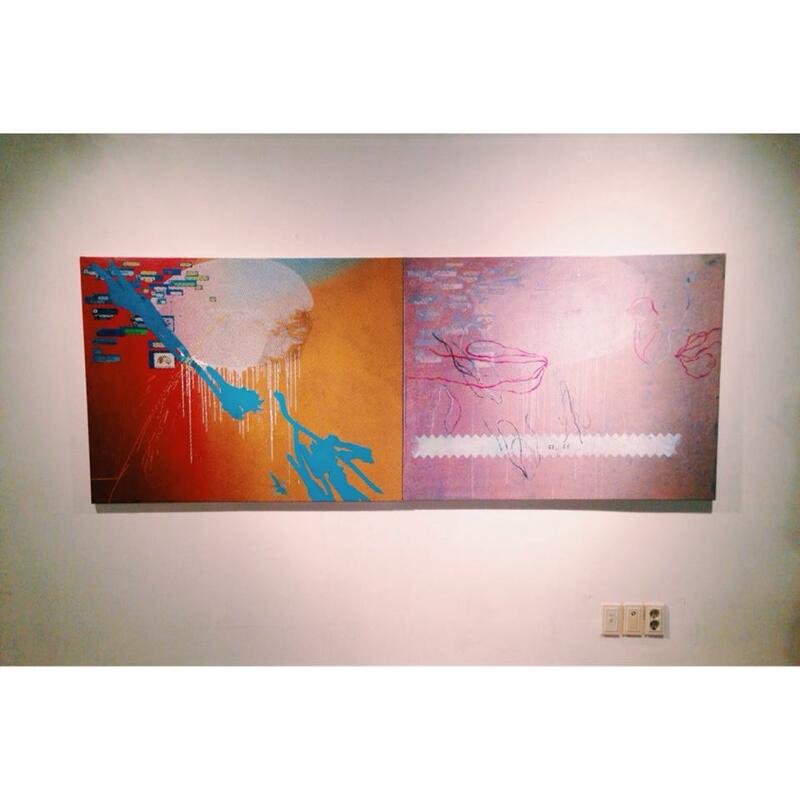 The show was curated by Yujin Yuna Song @4bid gallery. Sooji Lee was born in Korea, grew up in Jakarta, studied in Seoul, worked in New York as a graphic designer and recently completed her masters at the Design Academy in Eindhoven. She was nominated for Gijs Bakker Prize and TDC(Type Directors Club) with the project presented in the gallery. 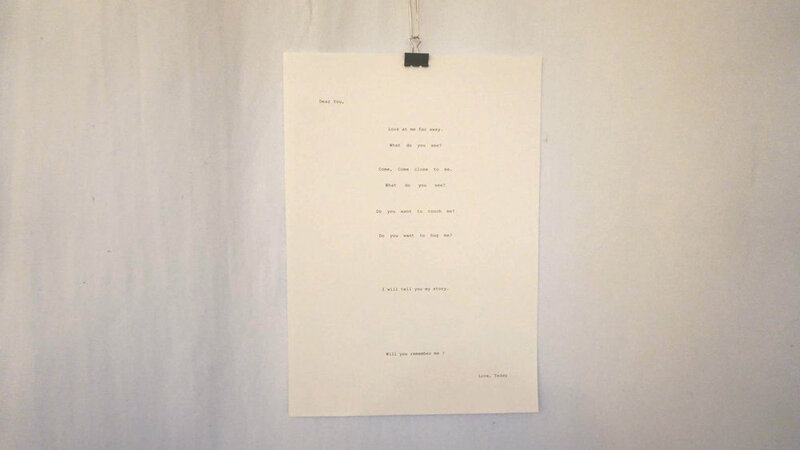 The exhibition began as a critical approach to the ‘personal statements’. Personal statement(which refers where you describe yourself on CV or motivation letters when you apply for jobs, which also simply defines your social status and reputation.) has become one of the hurdles young adults have to overcome before they can take part in the real world. We all often exaggerate even distort our true selves to be best fitted to the requirements of such personal statements, the charade of which has even come to a point where we call it “personal fiction” instead of “ personal statement." Such a social trend(in South Korea) has brought us to ask, is it our existential limitation as human beings to conform to the ‘norm’ modern capitalism has forced upon us? Can we think of a creative response to such norms? Through this exhibition, we have empathized with artists who have made their efforts, however weak or trivial they may be, to this end - to discover our true selves. Together with the artists, we curators aimed to recognize our present state where we confine ourselves within the frame that the society mandates, and at the same time, to identify the potential of art as an alternative that pursues the true ‘form of self’ which will create aesthetic harmony and critical coexistence. Even though it may sound premature, we hold our ground that this is the cornerstone of creating a community that embraces diversity and endlessness of youngsters’ lives. 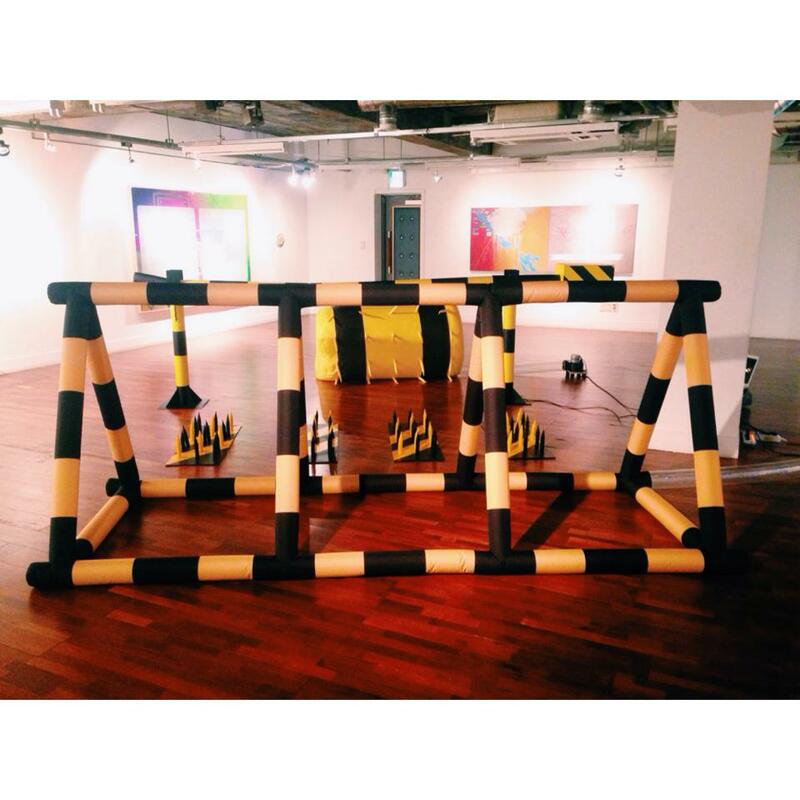 The exhibition stands as our statement that we will not resign in our efforts to change the conditions of our lives. ETC (Enterprise of Temporary Consensus) express their feelings that artists also can do their share in society. Jungsuck Kanag tells, in an honest, serene tone, the stories of people in their 20’s who face a gloomy future. Mirae Kim turns her eyes towards the terror and instability of youngsters who have to jump into the fierce jungle for survival. Jaebum Kim searches, within posing models in front of the camera, for the passive way of life personal statements force upon us. Sangjun Oh escapes from the ever more aggressive and speedy world, and forms his own imaginative world. Eunju Roh designs an ‘architecture of support,’ required for citizens in the modern world. Kyung-Ho Back staggers on the verge of normality and abnormality that the society defines. Heaven Baek shows us what the ‘real’ society looks like, formed by inter-relations between individual members of the community. See sang tells us that we need to look back upon ourselves who so undoubtedly confirm to things with which we are familiar. An Min-Jeong searches for her true self within her personal experience and everyday life. Yoo Haw-Soo looks back upon the reality that we have to earn money to do what we dream of. Lee Woo-Sung captures in his lens the emotions 880 thousand-won generation youngsters are experiencing. Lim Ju-Yeon pictures her true self that reveals itself only after the artist’s clothes, the symbol of fakeness and disguise, are taken off. Seo-Yong Chang talks about how other people’s perceptions define our identities. Ho Sang-Gun focuses on the faces of everyday objects we casually see. 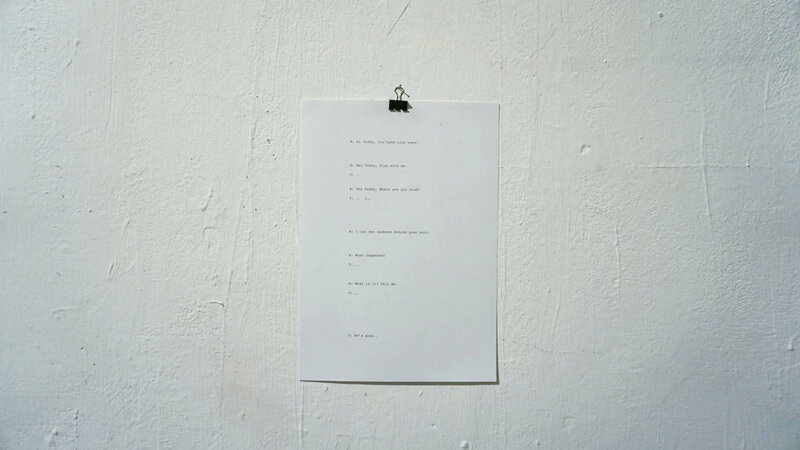 The exhibition started with familiar questions but insist to end with unfamiliar answers. We face to/run into endless questions in our lives. Yet the questions are so familiar that we don't even regard them as questions anymore. we are surrounded by the questions floating around that lost the unfamiliarness which is its very purpose in the first place. Quesitons make us explore, so we arent' stuck at limitaions and they lead us to fresh deviation, like unfamiliar answers. 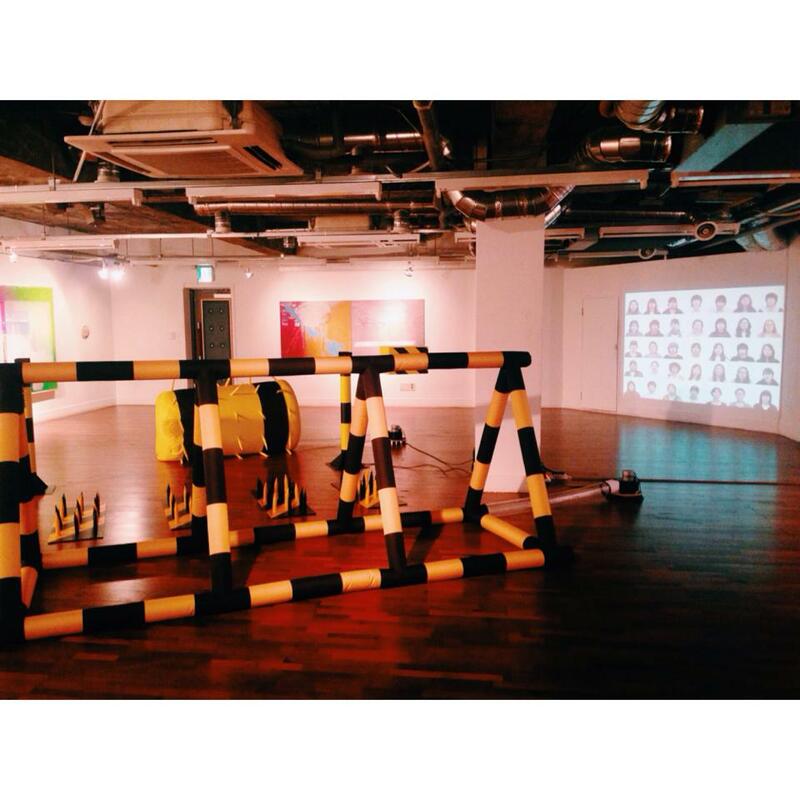 The exhibition space is designed to create an unfamiliar experience to the audience. When the audience steps into the space, they immediately run into a giant installation which creates an uncomfortable/unfamiliar feeling. The display of art works start with drawings of unfamiliar and imaginary world on the world also with few installations. Following video installation and paintings, we place them in different positions so audiences can leave the exhibition with refreshing/unfamiliar point of view and different attitude to familiar questions.